When your child’s hand prints are mounted and the project is almost done, choose one of the hand print poems below and print it carefully on the back of your art work. The paper that you use for your hand prints can be plain white paper, light colored paper, or construction paper. Trim around all the sides with pinking shears or decorative edge scissors to create a ruffled effect. Paint the palms and fingers of your child’s hands with acrylic paints. You can use one color, or experiment with stripes of different colors, or paint each hand in a different color. Have your child press both painted hands on the center of the paper. Some children (and their helpers) will find it easier to work with one hand at a time. Very young children should be assisted to position one hand on the paper and then to press down properly to get a nice clear print. Wash and dry the first hand, then repeat with the other hand. Cut a piece of backing paper so it will frame your art project evenly all around by at least one inch. Leftover rolls of wallpaper work very well for this purpose. You can also use larger sheets of construction paper. Glue the hand print to the middle of the backing paper. 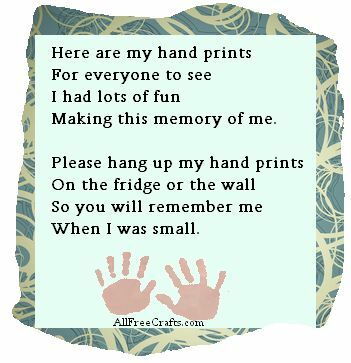 Either print and cut out the poem image shown here or write out your own copy, then glue the poem to the back of your hand print keepsake. Making this memory of me.